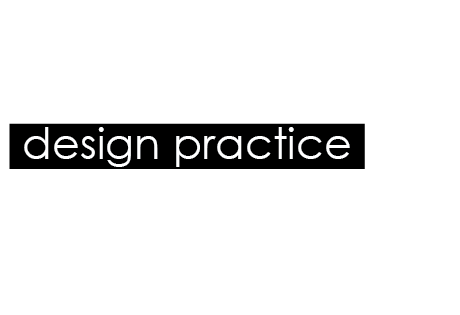 We continued to develop our skills in type and grid after receiving the InDesign brief. In the two sessions with Lorenzo we had to choose to articles, one from a high end magazine and one from a low end magazine. We then ha to compare the visual differences on content and layout. - the high end mag uses a lot of serif fonts which are quite elegant, compared to the low end which uses more plain san serif fonts, it doesnt show much sophistication. - the high end mag has a more formal and structured layout, that is well organised. - the low end mag is very cluttered and doesnt seem to make good use of its grid. - the low end uses a lot of text wrapping around images through the article, which makes it appear messy and disorganised. - the low end uses a coloured gradient background on every page, which makes it look cheap and a bit tacky, where as the high end has crisp white backgrounds which allows the information to have complete hierarchy over a busy background. - the low end mag has puzzles besides the article, which makes the pages look crammed and too busy, it also takes away attention from the article and important information. - the high end just focuses on the main article with no distractions. 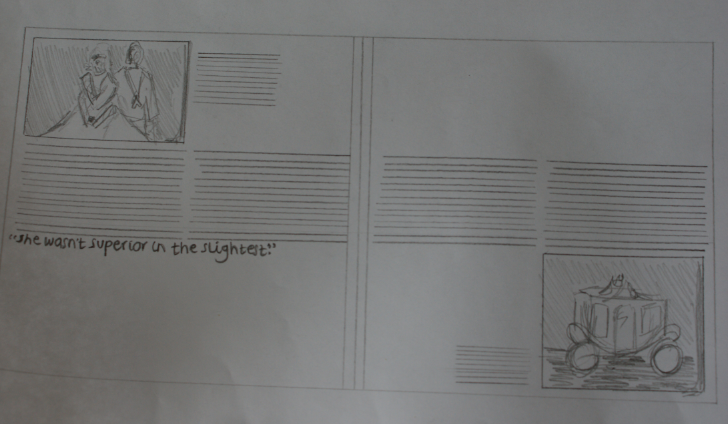 I chose to focus on the high end mag's layout to re design, first i had to do a rough word count. I did this by averaging the amount of words on a few lines, i then times the average by the amount of lines within the whole article. Me and the people on my table had a guess as to how many words there was before i counted, as its good practise to try and work it out by the eye. The article talks about the royal wedding of the Duke of York and Lady Elizabeth Bowes- Lyon (the Queens Mother), in 1923. There is a small section that talks about her beautiful wedding gown. On the other page a lady tells her story of seeing the Royal wedding all those years ago and how it was such a wonderful occasion. She talks a lot about about Lady Elizabeth and how she was much like any other person, quite normal and common. I created a grid for my designs which has 8 columns each page working on a scaled down format of 50% of a 210x210 mm square per page. I also gathered relevant images to the article, so i could experiment with layouts using different images at different scales. Images include photos from the most recent Royal wedding of Will and Kate, Royal wedding memorabilia, Union Jack flag and bunting, historical wedding photos and celebrity weddings and the 'royal gypsy wedding'. I did an array of layouts, some formal and others a bit more playful. This particular layout was more formal, i have extracted a quote from the article and enlarged it on the right hand side, this quote helps the reader know what the article will be about. 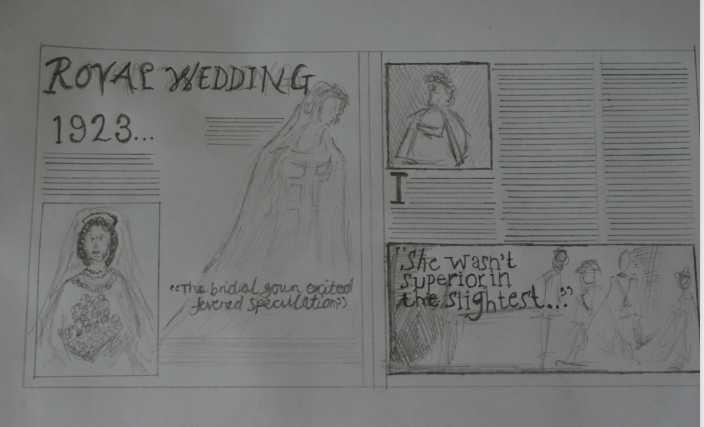 On the left i have moved the illustration of the lady in the dress to the left hand side and moved the old vogue magazine image to the right and made it slightly bigger, the writing in this has been shaded darker, as has the main heading, to show hierarchy. I have used an elegant font for the title as this reflects the elegance of the topic, which is a Royal wedding. I have made the title very large as to emphasise on its importance, the title is very straight to the point and the reader would straight away know what the DPS is about. This layout is another more formal one, i particularly like the enlarged image with text wrap on the right hand side, it keeps it interesting and there is a nice balance between the amount of text and the image, i think this is important as the original article layout had a large amount of text block, so i think breaking it up like this makes it easier to read. 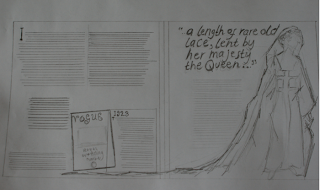 On the left hand page, i have enlarged the Vogue magazine image and placed it in the centre of the layout, with the illustration of the woman in the gown slightly smaller but she fits in the space nicely, the text is then wrapped to fit between the shapes of the two images. I dont think that the size of the heading works well on this one, it is set along the length of the top of the left page, but because of its size it doesnt seem to have much hierarchy, which i think it needs. This layout is a more playful one, compared to the ones above, the illustration of the horses has been enlarged and is set along the length of the DPS. There is less text on the left hand side, with the title being a lot bigger than previous, but still using an elegant serif font, i have emphasised on the year as i think it makes it clear that the article is celebrating a historical wedding rather than the most current of Will and Kate. The right hand page has a smaller image placed at the bottom right hand corner, but i think it looks a bit odd, it kind of makes it unbalanced, but i think this may be good. I have enlarged the first letter of the text to show where the reader should start. This one again, is a playful layout, i have used the separate images i collected within this design. I took the image of the bunting and used it to 'decorate' the DPS, it is very patriotic. The year of the wedding has been kept enlarged to make it clear which wedding it is. The title on the left page has been left aligned to the second column of text, which wouldnt usually happen, although this gives the impression that the reader starts reading from the second column. I have placed a wider image that fits along the length of the two columns of text, which in a way makes it more formal and organised. The text on the right hand side has been kept to one column and the rest of the space is taken by the images and the enlarged quote. In the crit, people liked ow the text fitted around the outlined dress, they said that it made the dress stand out and gave the text a more interesting shape. 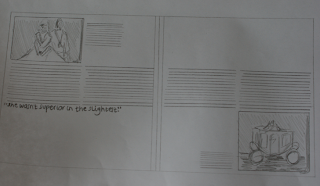 The heading has been placed central to the page and has been shaded darker to show it is to be read first. The left hand page has been over taken by a union jack, two wider columns fill the top half of the page on top of the image, whilst the title fits in the centre. I have used the bunting again on this one, but made it neater and only on one half of the DPS, i have kept the information on both sides in an organised way, with a bleed surrounding them. They both have three columns of text on them and an image too. They are pretty much opposite to one another in their layout. The quote on the right looks a bit astray from the rest of the content, but in a way this makes it stand out more. This layout is very busy, especially on the right page, i have used a similar layout to the original apart from i have swapped the placement of the text and image around. The left hand side has a lot on it but there is still a fair bit of negative space. 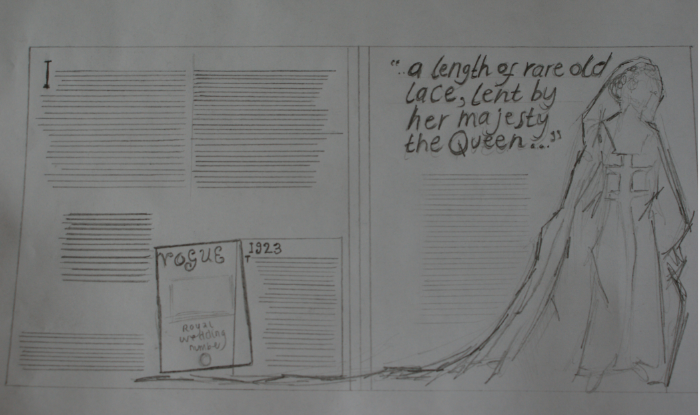 I have allowed the illustration of the gowned lady to fill half the page, with an image of the Queen sitting down the left hand side with a caption above and the year of the wedding the article talks about. I like how the enlarged quote sits over the illustration, as this shows hierarchy. 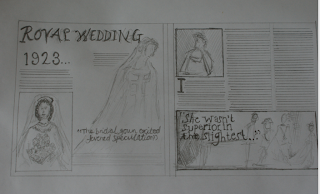 This was another layout that was liked in the crit, this is because the illustration of the lady overflows onto the left page, from the right, the text on the right fits against the shape of the woman, and the enlarged caption is clear to read and stands out the most out of the whole DPS. The left hand page looks a bit messy, i think this is because of the two smaller captions. This layout is very se-metrical with its text placement and the images. I think its very boring an doesnt make good use of the space, although sometimes less is more.